Faith is an important feature in the lives of many top players. Practicing Catholic players include: Wayne Rooney, Reyes, Gilberto, Cech, Crespo, Del Horno, Duff, Alonso, Morientes, Ronaldo, O'Shea, Luque and Prso - to name but a few. Most clubs have their own chaplain - Barcelona even has a chapel in their grounds. And all clubs have special Masses said for them throughout tournaments. 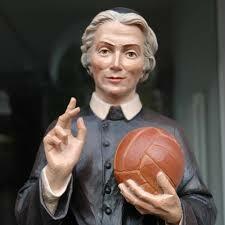 Since 2001, football players have had their own patron saint: St Luigi Scrosoppi. Born in 1804 in Udine, northern Italy, to a very poor family, Fr Luigi devoted his life to working with poor young men and women, establishing many orphanages and schools enabling young people to better themselves by gaining an education and skills. He also encouraged boys to take part in sports and is often depicted in art carrying a football. S. Luigi’s feast is kept on October 5th each year. S. Luigi Scrosoppi, pray for us!